"The Wait is Over" is how T-Mobile is announcing the in-store launch of the G1 Android phone, after its first-sales yesterday in a special San Francisco event. If you want one, drop in to one of the "T-Mobile retail stores and select third-party stores in major cities where T-Mobile’s 3G service is currently available" this morning from 8AM, where you'll find them in stock and G1 experts in-store. Stores not carrying the phone for immediate purchase will have a demo model, and will help you order one for later delivery. Press release below, including links to help you work out if you're in one of those lucky areas. BELLEVUE, Wash.—(BUSINESS WIRE)—T-Mobile USA, Inc. today announced the national availability of the highly anticipated T-Mobile G1 with Google, the first Android™-powered mobile phone. The T-Mobile G1 combines full touch-screen functionality and a QWERTY keyboard with a rich mobile Web experience, dozens of Android Market applications, and popular Google products that millions have enjoyed on the desktop, including Google Maps Street View™, Gmail™, YouTube™ and others. Beginning today, consumers can purchase the phone in select retail stores across the country and online at http://www.T-MobileG1.com. “During the past month, we’ve seen unbridled excitement for the T-Mobile G1 and the positive impact it will have on the mobile lives of our customers,” said Denny Marie Post, chief marketing officer, T-Mobile USA. “In fact, among those T-Mobile customers who have pre-ordered the phone, roughly half have traded up from a basic handset, illustrating the leap many consumers are taking to a rich, accessible mobile Web experience. Its design, functionality and value make the first-of-its-kind T-Mobile G1 a truly approachable device for the masses.” With a fun and intuitive user interface and one-touch access to Google Search, the T-Mobile G1 is the first phone to offer access to Android Market, which hosts unique applications and mashups of existing and new services from developers around the world. Customers can find and download a wide range of innovative applications—from games to social networking and on-the-go shopping—to personalize their phone and enhance their mobile lifestyle. Even better, for a limited time, the dozens of applications available on Android Market are available free-of-charge for T-Mobile G1 users. “With new, high-value applications constantly being added to Android Market for customers to discover, the T-Mobile G1 is the phone that grows with you,” said Post. “And as the Market continues to grow and evolve, the possibilities are virtually endless.” Customers can purchase and carry away the T-Mobile G1 at T-Mobile retail stores and select third-party stores in major cities where T-Mobile’s 3G service is currently available. T-Mobile 3G service is currently available in 95 major cities across top population centers. For a list of cities where T-Mobile 3G service is available, please visit http://www.T-MobileG1.com/3G.aspx or see T-Mobile’s Personal Coverage Check tool, available online at http://www.T-Mobile.com/Coverage. All T-Mobile stores across the country will have demonstration devices on-hand and can assist customers with ordering the device for delivery at a later date. T-Mobile is working to ensure that customers have a great experience harnessing the power of their new T-Mobile G1. Specifically: * T-Mobile has established a collaborative online forum dedicated to the T-Mobile G1 (http://forums.T-Mobile.com) where customers can ask questions, share tips and get helpful information. * All T-Mobile retail stores will open early at 8 a.m. on Oct. 22 to give everyone the chance to experience and purchase or order the T-Mobile G1. * T-Mobile G1 experts will be on-hand at retail stores to demonstrate the phone and answer any questions. 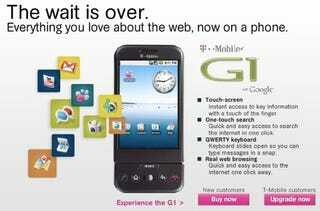 For more information on the T-Mobile G1 in the U.S., please visit http://www.T-MobileG1.com. Notes: Additional charges may apply to features and services. 3G service may not be available in all locations. Price and availability of device subject to change; taxes and other charges may apply.